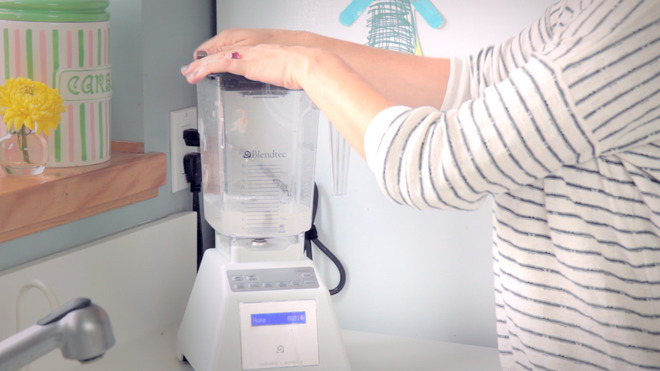 In this video I reveal the secret trick to cleaning your blender in under a minute. Or maybe this isn’t a secret to you, but when my new Blendtec Blender arrived with this tip in the instructions, I freaked out with excitement. Had to share the knowledge with y’all. Oh, and also, I’d like to share a blender! That’s right, we are giving away a Blendtec Total Blender Classic WildSide! Blendtec blenders are amazing, you are going to fall in love with yours. They’re like the cadillac of blenders. So, to enter, head on over to our YouTube Channel at youtube.com/prudentbaby. Subscribe to the channel, and leave a comment on this video, “How to Clean Your Blender.” Go ahead and share your favorite kitchen tip in your comment, or tell us something you’d like us to show you in video. Follow blendtec on facebook or twitter, Tweet, share on fb, or pin the giveaway and leave another comment each time for additional entries. We are so in need of a blender! Mostly to make desserts 😉 I followed the channel and liked them on Facebook! I suscribed to the channel, and liked Blendtec blenders on FB. Love your tip! Liked Blendtec Blenders, and suscribed to the channel. i subscribed to your channel. cool. i would love to see you show us how to sharpen good kitchen knives without messing them up. Love Blendtec. I did all of the above, but couldn’t work out how to comment on the video. I would love to win a blendtec..I’ve liked and posted my comments under your YT video. Love, love, love this prudent tip! I don’t have a Blentec, but I know this will work on my regular drab blender too! …totally pinned this! i can’t stand most blenders i use, because they just don’t seem as powerful as this brand. i would love to win! I’m following blendtec on facebook. My cousin has one of these blenders and she swears by it! Would love to win one!! I follow you on Youtube and I pinned the giveaway. I never thought of cleaning it like that before! I try to wash dishes and wipe up messes as I go to save time after the cooking is done. I hate cleaning, so this helps me stay on top of it. Would love to see more kitchen tips. Pinned the giveaway (Seems like it’s my first pin, still new to Pinterest). On a side note I’ve been looking for a blender. I love the power behind the Blendtec and that they are smaller then Vitamix. It’s just the price that makes me pause before taking the plunge. Now following Blendtec on Twitter. I follow blendtec on fb! I pinned the video onto Pinterest! Let’s see I follow Blendtec already, but I posted it here as a comment and on the youtube comments section. Oh, I subscribed to your youtube channel. And I clicked on the box, that will tell me when you upload a new video to the channel. That is really handy. That is a great tip to follow interesting youtubbers. Did you know that the “Pioneer Woman” uses a BlendTec? Must be good! (Did my post on twitter and pinterest show up?) I might need to repost those. Great tip! I subscribed and commented on the video. I was able to comment and subscribe to the video. What a marvelous give away. I love blendtec! Blendtec blender cleaning is my favorite kitchen tip. Thanks for the tip and the cool giveaway. I want the wildside sooooooo bad! Subscribed to the channel and liked Blendtec on FB. Love using my blender for smoothies. subscribed to youtube channel, follow on fb and pinned it. would love love love this blender! i am currently working on eating healthier and a new blender would be awesome for my green smoothies… happy blending! I subscribed to your channel! I have had a Blendtec on my wish list for SO long! My husband and I are just on a really tight budget and can’t really buy stuff right now. I do, however, already follow them on Twitter, I subscribed to your youtube videos, left a comment and I would love to see a Salsa made in a Blendtec! subscribed to your youtube channel & left comment. subscribed to the youtube channel. My tip is when I have to cover a bowl with cheesecloth or kitchen towel I use an elastic headband around the rim. It’s bigger than a large rubberband and easier to work with. I subscribed to you tube channel. My favorite tip in kitchen?! Clean up as you go! I like Blendtec on Facebook! Following Blendtec on Twitter via @serene_streams! Watched and commented on video. What a fast and easy way to clean a blender! Thanks! I was able to comment and subscribe…yellowstarkiss. I would love a blendtec blender! Liked Blendtec on Facebook 🙂 My kitchenaid is okay … but I would LOVE to have a blendtec on my counter!!! I subscribed to your youtube channel & left a comment. I also like Blendtec on facebook. I’d love to win this blender! I Like Blendtec on Facebook and follow on Twitter. Left a comment on the Youtube video and subscribed to your channel. It was a great tip, thank you! This was an excellent tip!!!! I am new to your blog but in great need of a new blender!!!!!! Thanks for the opportunity! I also am a fan of blendtec on Facebook!! I forgot to put in my last one that one of my favorite kitchen tips and that is cleaning my fridge with vinegar and baking soda, it acts as a natural scrubber and freshens the fridge at the same time!!! Just shared the giveaway on pinterest!!! Been doing it this way for years! I suscribed to your channel on YT. Also, I already follow on FB. I subscribed and left a comment on the video page. I follow bendtec on facebook. I subscribed and commented! My best kitchen/blender tip is to clean it asap, otherwise it get stuck! I follow Blendtec on twitter (@channynn). I like Blendtec on FB, (Shannon Finer). Subscribed & commented on youtube! My kitchen tip is that you can use baking soda and a ziploc bag to clean your burner pans on the stove. I’d like to see how to make some baby food if you haven’t already done it. Pinned your wonderful tip for cleaning a blender! My tip: drop three alka seltzer tablets down a clogged drain and follow with a cup of white vinegar. My tip is to clean messes and spills as soon as their made. It’s simple, but I find that it takes work and it really helps. Not sure where to put these. Commented on the video and subscribed. Smoothie Mixer von Blendtec aber irgendwie kann ich nichts finden. Was empfehlt Ihr? Der Mixer soll nur Vitamin Drinks machen.